Jules: God Knows Your Name! 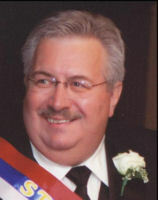 Johnstown, PA - Much more than "Flood City!" Novak (Nole) Djokovic cookies & more! Before I lose this recipe again, its' time to put this on the website where You and I can find it anytime we need it. This delightful SERBIAN Specialty dessert came to me via Milan and Roz Opacich. Roz swears by it, says it's a crowd pleaser all the time, but she made sure she gave the credit to our late friend, Stevo Medich, for inventing it. I'm making it today (7/3/08) for the first time for our July 4th party tomorrow! OK, looks good. Make sure you grease & flour the bundt pan well. I could have done a little better on this end. (Didn't have Crisco, used Pam). From Pittsburgh's Danny Capuzzi, now in Detroit, along with Donna Medich, we now even have +Stevo's drawing that accompanied his Slivovica Cake! Thanks for sharing, wonderful ones! :-) !!! Melt butter, stir water and sugar together, boil for 3 minutes and then remove from heat. Add the Schlivo and stir all together. Then pour over the top and sides of Your Schlivo cake! Ummm! "Everybody LOVES it," says Roz! No wonder! Here's the gang, with Stevo in the middle. This would be a good place to urge you to look up more information about the Serbian Singing Federation of which +Stevo devoted his life, and also the St. Elijah Website! Don't forget to come back! 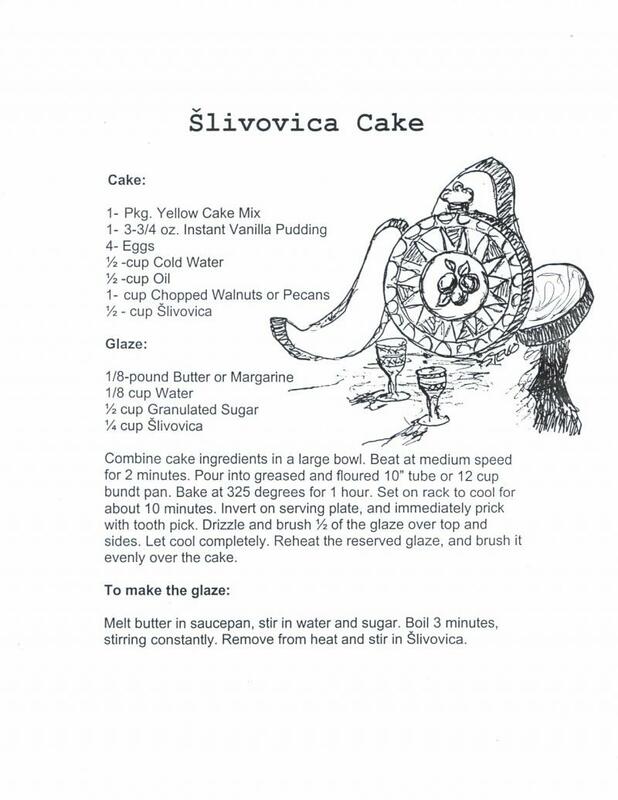 Today, St. Sava's Day, 2011, Melanie Tomich Limerick listed another version of the Schlivo Cake on Facebook. So, take your pick! This one calls for a little more schlivo! Preheat oven to 350 degrees. Grease & flour a 10" tube pan (Bundt pan is ok too.) Sprinkle the ground nuts over bottom of greased/floured pan and set aside. Sift together flour, baking powder & salt...set aside. Cream butter and sugar together until fluffy. Add eggs and vanilla to creamed mixture and beat at medium speed until well mixed. Add Slivovica and flour mixture to creamed mixture, alternating with milk, beating well after each addition. Continue beating for one minute. Pour batter over nuts. Bake at 350 degrees for 1 hour.....cool. After cake has cooled, invert on to a serving dish. Prick top and pour glaze over evenly. Melt butter in saucepan. Stir in water & sugar. Boil 5 minutes, stirring constantly. Remove from heat. Stir in Slivovica. Pour over cake, which has been pricked with holes.